Flags of Venice and Lega Nord. Source: Wikipedia Commons. From its inception in 1950, federalists and intergovernmentalists wrestled for control of a project to unify Western Europe on economic and political terms. For most of its six decades of existence, those who were reluctant to cease a growing share of their sovereignty to European institutions in Brussels held federalists at bay. Booming postwar economic times fueled the dream that a primarily economic union sustained by a gargantuan bureaucracy could save the European Union, as it was known since 1992, from a growing number of Eurosceptics on all sides of the political spectrum. The large presence of Eurosceptics in the European Parliament as of May 2014 questions the viability of the European project. It signals that popular disengagement with European institutions and legal frameworks is not a passing fad until now dismissed as protest vote, but rather an underlining current set to limit the expansion and deepening of European unity. In order to comprehend the heterogeneous group of opponents to the European Union, journalists and scholars have labeled them Eurosceptic, xenophobic, and Islamophobic (see here and here). Although these labels are useful in order to focus attention on the minority groups these parties violently oppose, they miss the important function of group cohesion these parties offer to disengaged ethnic Europeans. The lens of nativism reconciles the different positions among these new nationalist parties about the role of the state and the place of national and religious minorities. Small identity movements (Platform for Catalonia), large Islamophobic parties (Danish People’s Party or Dutch People’s Party for Freedom and Democracy), and successful xenophobic extreme-right parties (French Front National) have in common a populist discourse that exclusively focuses on the plight of ethnic Europeans who feel victimized at the hands of ethnic and immigrant minorities and traditional political elites. Nativism is a political ideology that favors a privileged status for a certain group above others who are defined as hostile and alien to the nation. According to John Higham, nativism in the United States between 1860 and 1925 defended the rights of a section of established inhabitants vis-à-vis undesired groups: Catholics, radicals, and racialized persons. In postwar Europe, nativism favors the rights of ethnic Europeans above those of immigrant ethnic minorities and European Roma. Nativists, who usually call themselves patriots, oppose immigration and support efforts to lower the legal status or political participation of specific ethnic or cultural groups. The European Union immigration and asylum policy has been tailored to placate the anti-immigrant stance of a growing number of European states. While the 1999 Summit of Justice and Home Affairs in Tampere, Finland focused on establishing a comprehensive policy for asylum and immigration that protected the rights and social integration of migrants in Europe, the 2002 European Council meeting in Seville, Spain refocused all efforts on protecting borders and stopping illegal migration. Nativists have promoted the same logic of protecting borders from unwelcome aliens to challenge the survival of some European states. 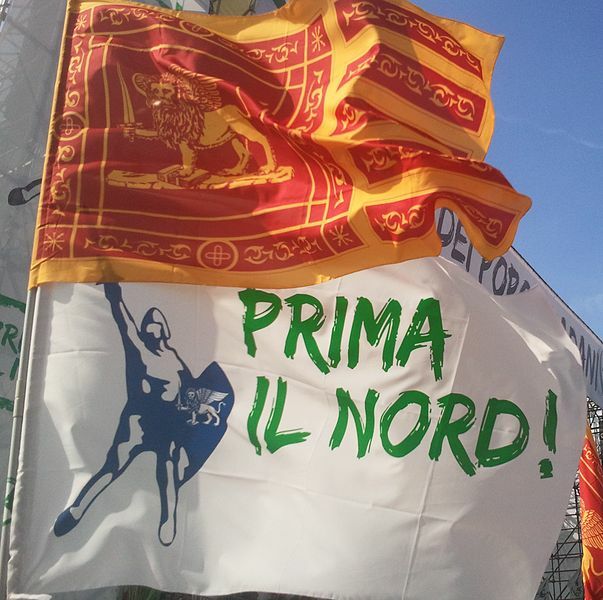 In Italy, the Northern League–a pro-north independence party–demands “The North First” against their traditional enemies south of Rome. The discourse of nativism is already endangering one of the key successes of the European project. German Chancellor Angela Merkel and former French President Nicolas Sarkozy have called on placing limitations on the Schengen treaty guaranteeing freedom of movement for all the citizens of state members. Marine Le Pen. Source: Wikipedia Commons. Some scholars argue that populism and xenophobia are growing in Europe because of the economic slump that began in 2008, but the second place finish by Front National leader Jean-Marie Le Pen in the 2002 French presidential elections tells a different story. Moreover, European nativism is not only embraced in the abandoned minefields of Northern England or Wallonia by the losers of the transition between the postwar extensive economic model and the globalized intensive economic model in which many areas of Europe are unable to compete. The recent success of Eurosceptic and xenophobic parties in the May 2014 European Parliament elections has deeper roots in the failures of the European Union project itself. A weak European identity only enjoyed by educated and mobile elites, a focus on austerity and macro-economic development at the cost of education, health, and social programs, and an inability despite its massive resources to communicate the complexity and relevance of the European Union project to common European citizens have created a gap easily filled by populist xenophobic discourses. Nativism is appealing to ethnic Europeans because it reinforces a familiar nationalist and ethnocentric outlook. Nativism twists the logic of privilege by enlarging the sense of victimization of ethnic Europeans and obscuring or blatantly denying the predicament of ethnic and migrant minorities. Nativism embraces cultural racism and presents itself as the last bulwark of European values (gender equality, freedom of expression, and the postwar social contract). European Nativism chooses as scapegoats historically persecuted groups, primarily Roma and Muslims, and blames them for the predicament and decadence Europe finds itself. European nativism speaks to a population that, with few exceptions, has not come to terms with their legacy of imperialism and their vicious twentieth century, filled with their courting with totalitarian ideologies and their genocidal persecution of minorities. [i] Pablo Neruda, “XVII,” One Hundred Love Sonnets, in The Essential Neruda: Selected Poems, ed. Mark Eisner (San Francisco: City Lights Books, 2004), 143.